USD$119.00 with free shipping worldwide, available online from Wingnut Wings' website. 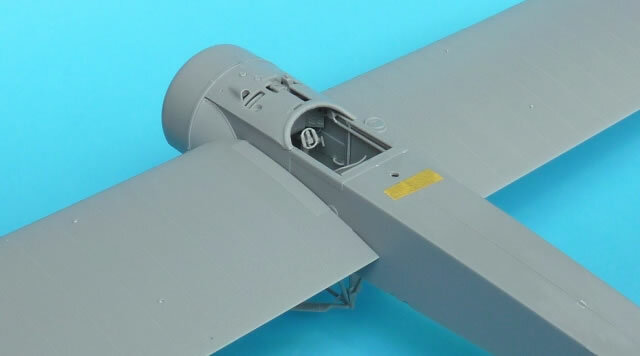 Accurate representations of both aircraft; outstanding detail; cleverly engineered for ease of assembly; crisp clean mouldings, decal sheet in perfect register with minimal carrier film, photo-etched parts and a comprehensive instruction booklet. Common cylinder parts with integrated spark plugs for both engines. 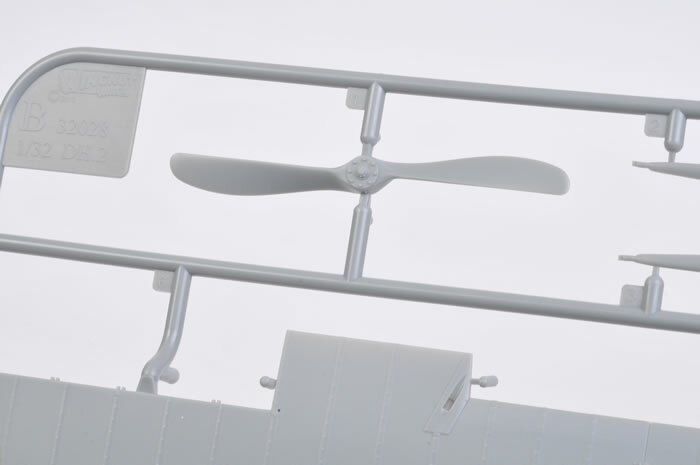 Wingnut Wings have added another couple of iconic 1/32 scale aircraft to their ever increasing range of WWI kits. This time it’s the early “Scouts” that take centre stage and the quality of the package is up to their usual high standard. 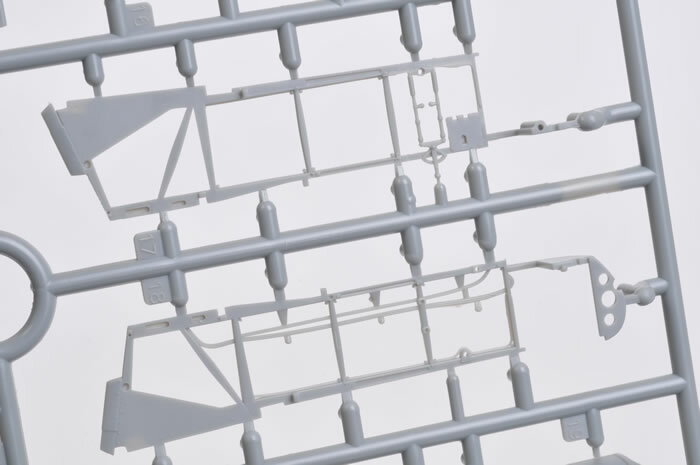 Despite the complexity of the rigging, both should prove to be relatively easy to assemble thanks to the clever engineering and crisp clean mouldings. 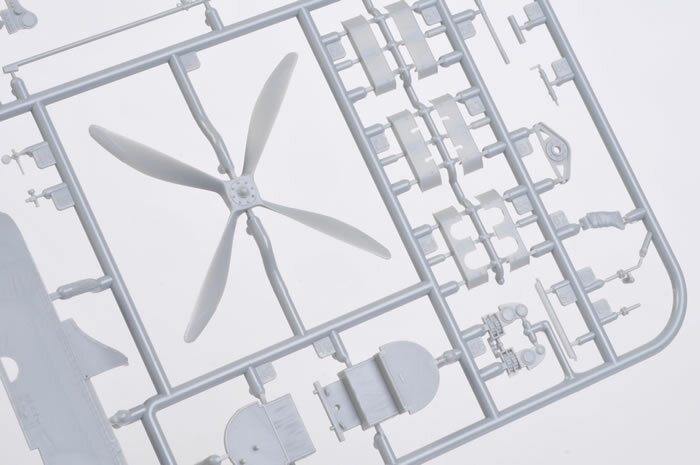 The result is a kit that is not only buildable but doesn’t compromise on accuracy to do so. New kits from this manufacturer are always eagerly awaited. Although the subject matter was not unexpected, the initial packaging was. Wingnut Wings, in a first for their marketing department, decided to release these two adversaries as a double act. 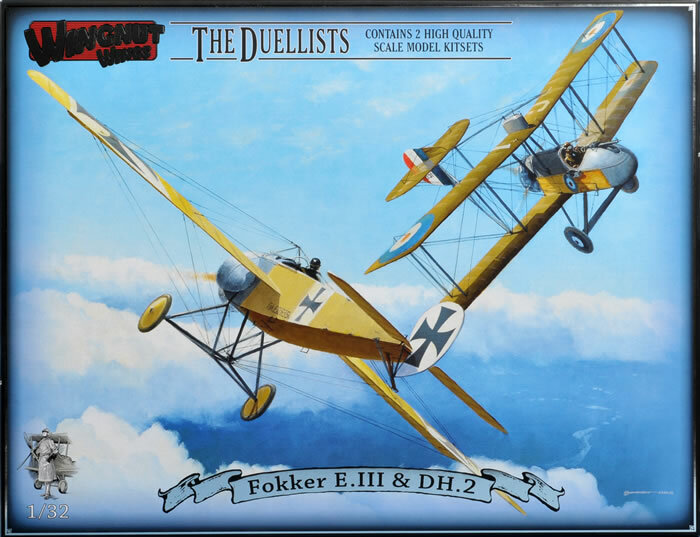 The Fokker Eindecker and Airco DH2 frequently encountered each other in combat so it is only fitting that they are pitted against each other in the modellers’ display cabinet. The huge box is split in two so that each subject occupies its own space. 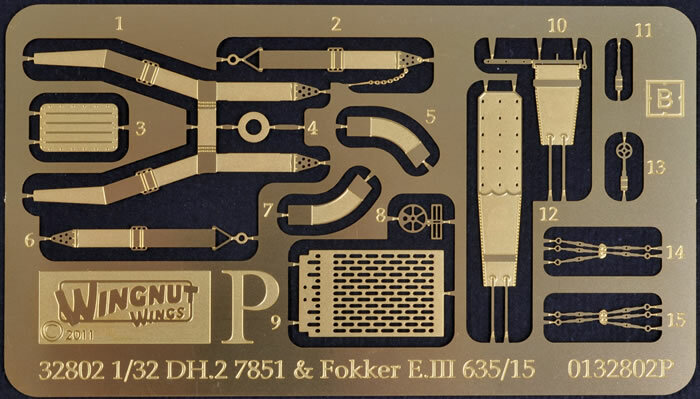 A common instruction book is shared between the aircraft, as is a decal sheet and photo-etched fret. 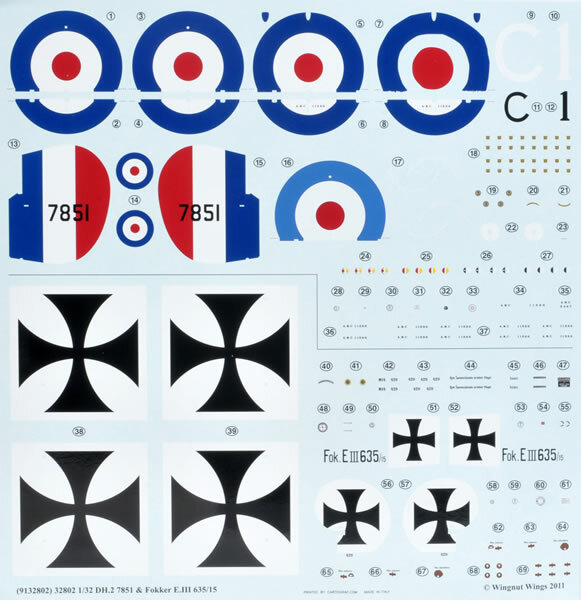 To keep the cost of the overall package down, only a single decal option is allocated to each “Scout”. 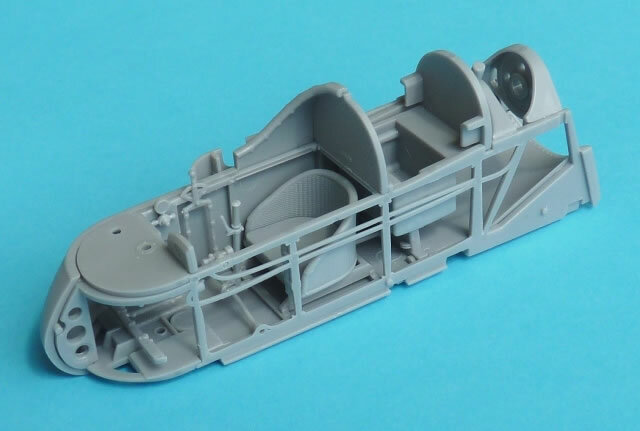 There are 7 sprues of light grey plastic (plus 1 clear item for the windscreens) and it’s obvious from these that many more Eindecker variants will follow. 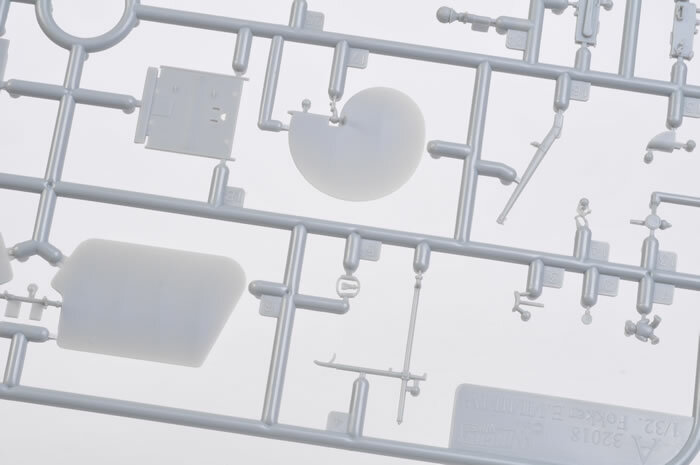 All of the parts are beautifully moulded with fine detail and minimal flash. 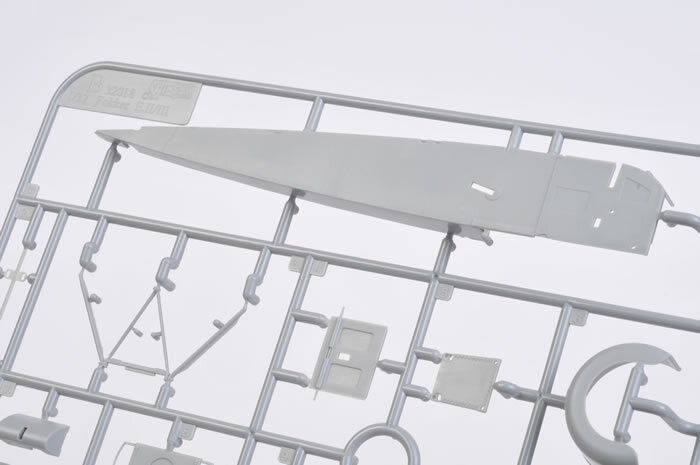 The only ejection pin visible on the completed model is found at the rear of the cockpit, the rest being conveniently hidden during assembly. The offending beast is easily removed without loss of detail. 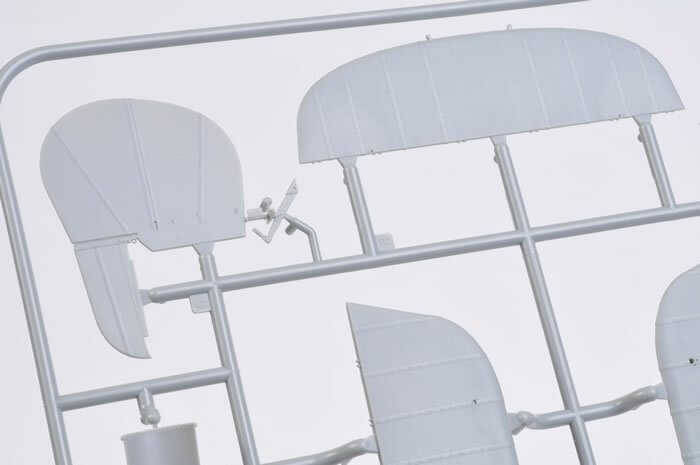 There was one small area of concern however, which turned up on one of the sprues. 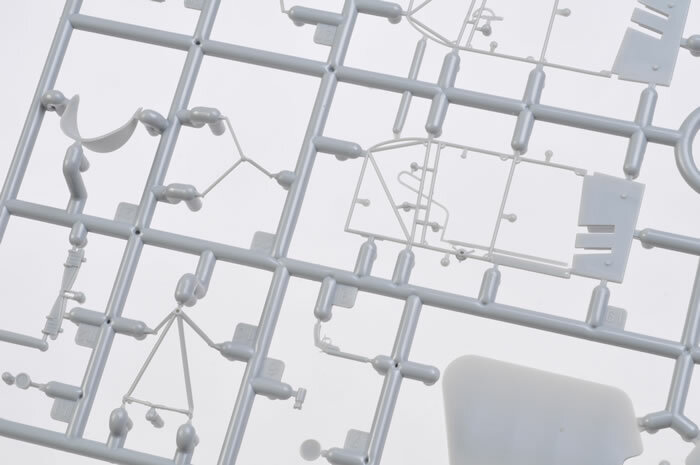 It manifested itself as a significantly stepped seam line thanks to the misalignment of the mould halves during the manufacturing process. This can become problematical when trying to maintain the correct cross section of an item during the clean-up process. 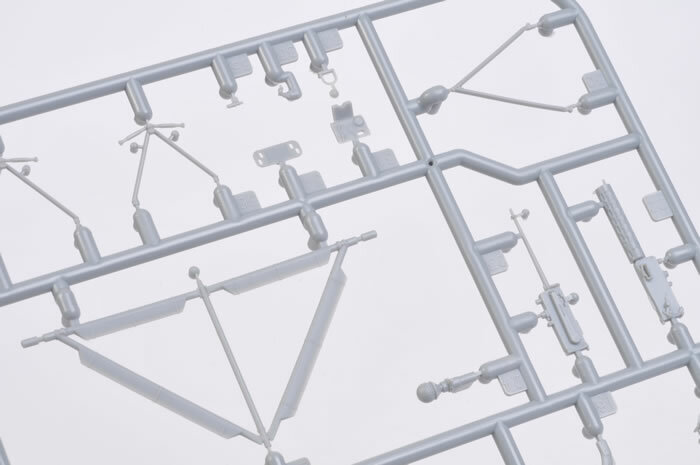 Often not appreciated are the attachment points that each part has to its parent sprue. Great care has been taken with both these releases to ensure that the areas concerned are either easily eradicated or are concealed away from prying eyes. The obvious place to start the build is in the cockpit. 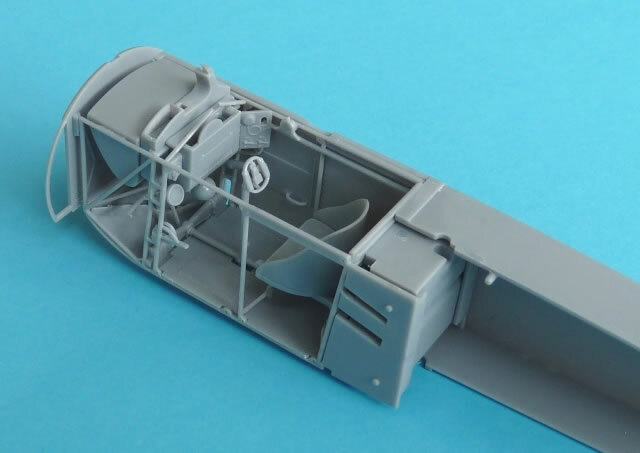 This interior is occupied by a comprehensive arrangement of fittings that include all the usual suspects such as seat, control column, rudder bar, heel guides, ammunition and empty belt bin. Also seen are the tachometer, pulsator, magneto, fuel control switches, “throttle”, air pressure gauge, hand pump, and engine air intake bulb. Purists may wish to add the handle for engaging the gun synchronizing mechanism under the coaming. 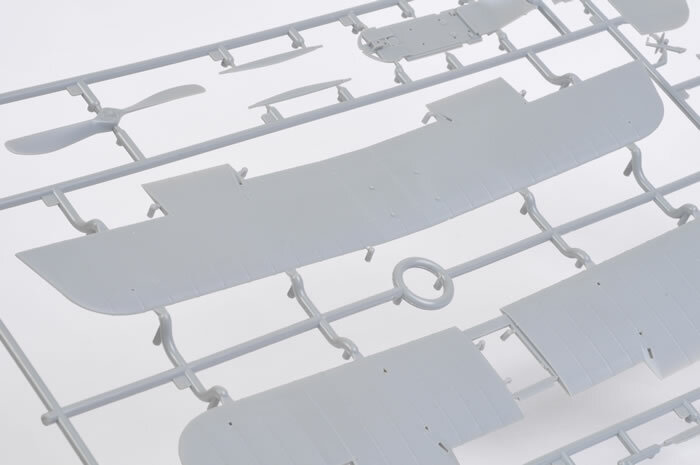 The interior framework comes as separate parts which attach to the rear plywood bulkhead and wing attachment aid. 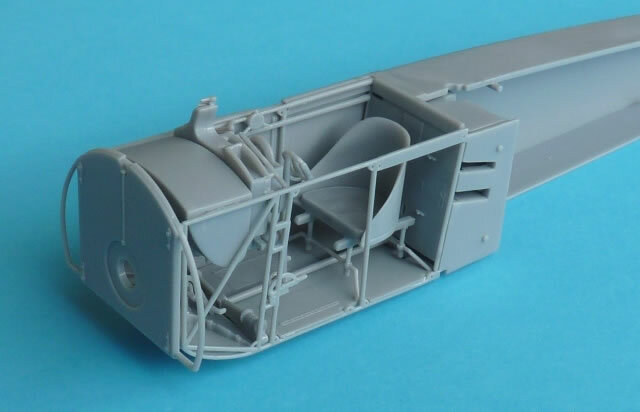 The hinged doors for downward viewing are nicely portrayed on the floor, as are the pilot’s sliding hatches on the fuselage sides. 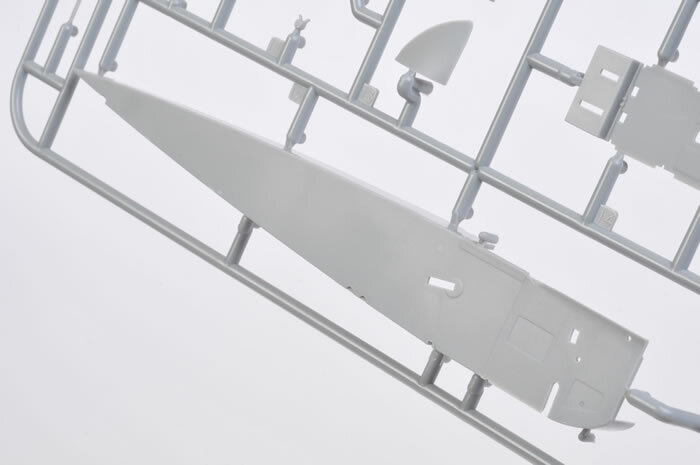 When these fuselage halves are brought together, the fit is perfect. 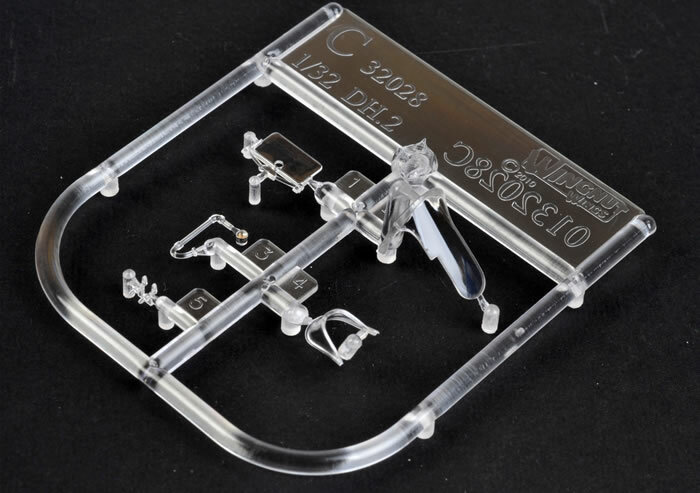 If you do encounter any problems, then check that the previous sub-assemblies are seated correctly. The photo-etched fret takes care of the seatbelts as well as the aforementioned elevated heel guides. A rigging diagram is supplied for the internal control cables and bracing. It’s easy to understand and leaves little room for doubt. Just remember that the wires running across the undercarriage bungee purposely cross over at a lower point than usual to allow room for the pilot’s legs. The underside lacing is treated in the same way that Eduard chose to do it on their Fokker D.VII series. Once again there were no problems with the fit and the results are as near to perfect as you are likely to get. 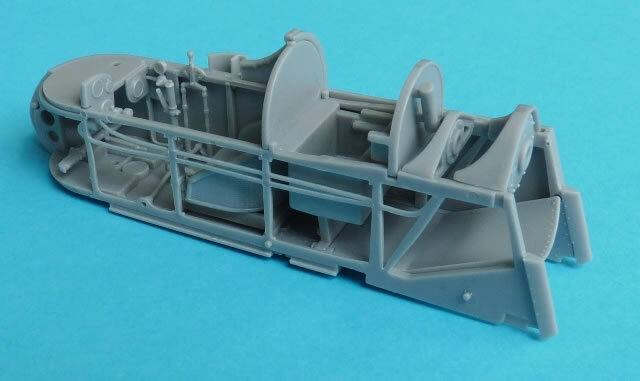 The upper deck, side checks and cowling are trouble free in their placement and the machine gun cleverly hides any mess the modeller may have made with the upper sprue attachment point. 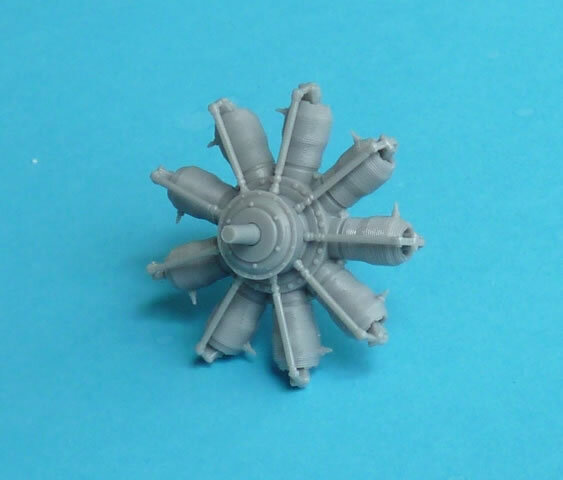 Here the modeller can replace the moulded on blast plate with a better detailed photo-etched replacement. The similarity of the 100hp Oberursel U.1 and the 100hp Gnome Monosoupape rotary engine persuaded WNW to use a common set of cylinders. Each version had the spark plugs located in a different area and both positions are represented. The modeller then has to scrape away the spark plugs that don’t apply to the version of engine they are building. Well…...considering the amount of detail and thought that has gone into the rest of these kits, this shortcut seems a bit surprising. 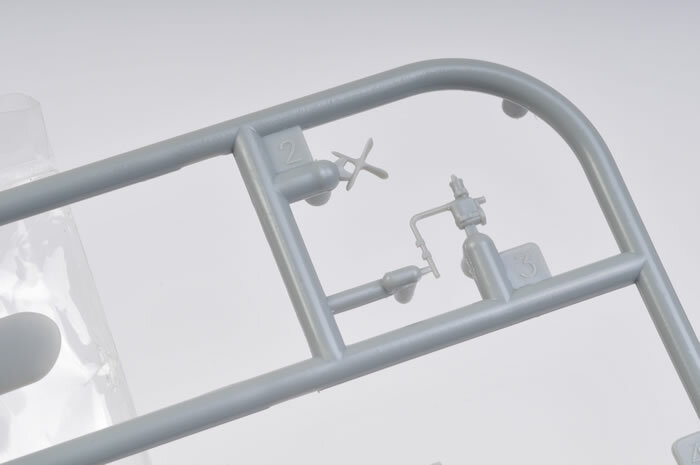 With the addition of two extra parts, the result could have been a set of cylinders with each having the correct spark plug layout. After all, the initial design has already been established. 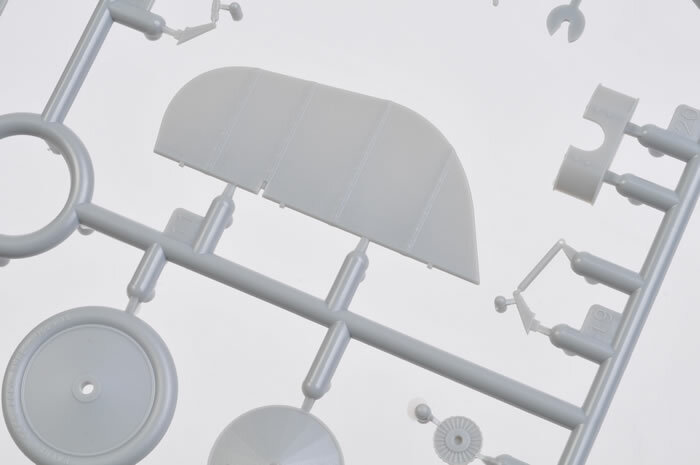 The problem the modeller must now overcome is to reinstate the delicate fin detail on each cylinder. Despite appearances, the undercarriage is quite strong. This is helped by having the assembly kept to as few parts as possible. It slips into place easily and remained “square” with no adjustments necessary. 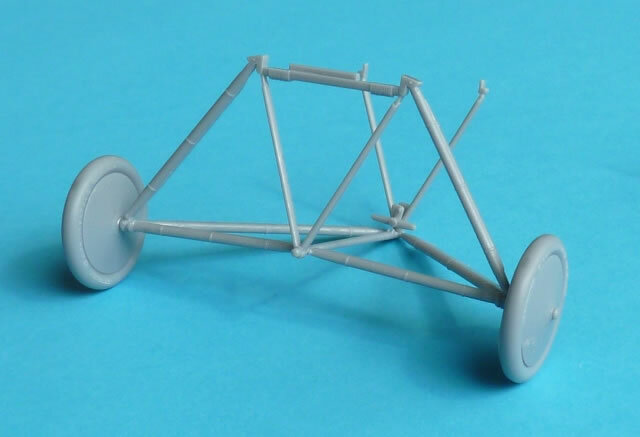 The tyres are separate from the wheel covers which paves the way for the addition of photo-etched spokes. The IMG 08 “Spandau” machine gun comes in 2 flavours. One can go with a full plastic version or if you want more detail, a p-e fretted jacket can be substituted. 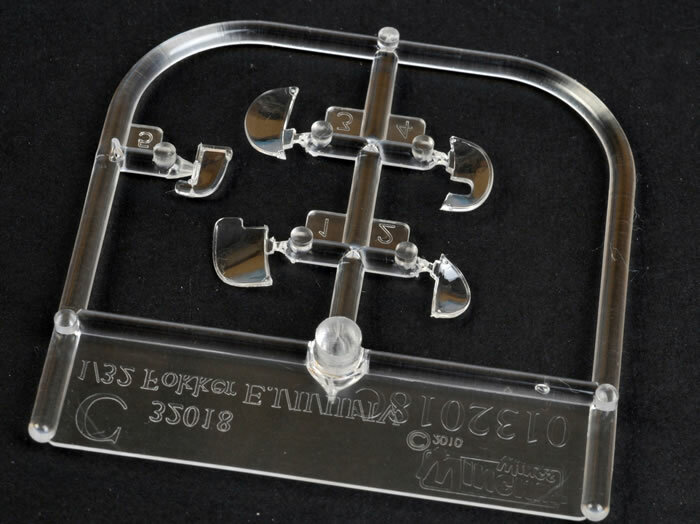 This also comes with an end plate and incorporated rectangular sight. 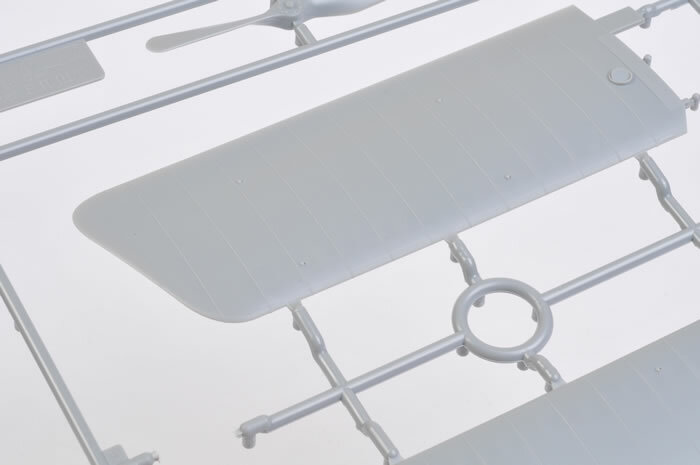 A major feature of these monoplanes is the wings. They are big, beautifully moulded, and carry no blemishes whatsoever. The tacked strips of cane are rendered superbly with delicate and consistent detail. Of course they carry quite a bit of weight and those that don’t rig using monofilament for structural integrity may get a little jittery at this stage. Don’t fear. The wings carry large slots that slide into Part F5 behind the cockpit bulkhead. 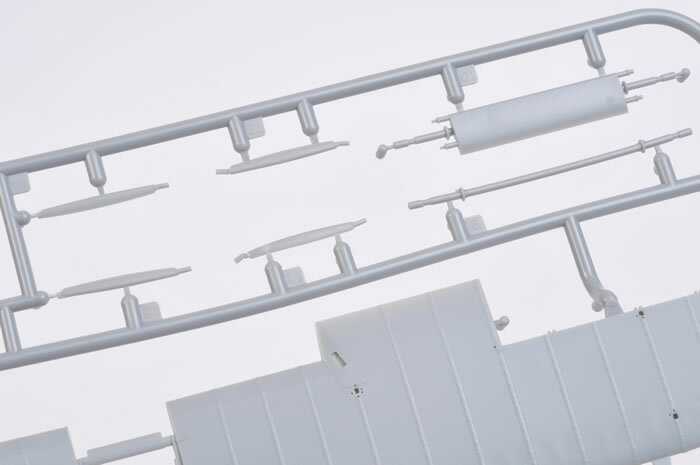 This secures them firmly into position and automatically aligns them to the correct angle. 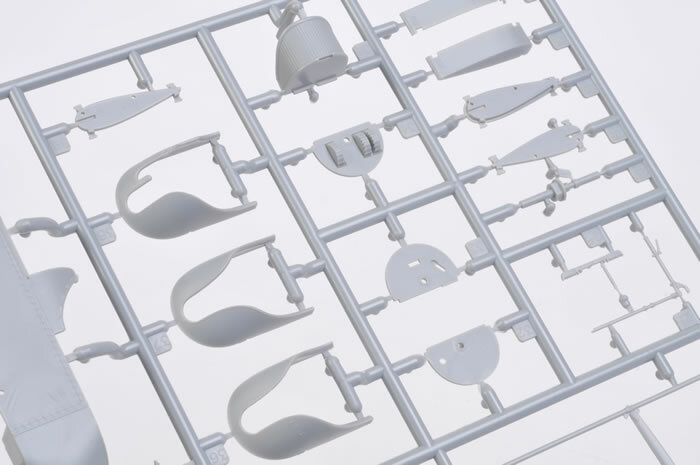 If yours display any anhedral or dihedral, the tab can be bent slightly for minor adjustments and reinserted. 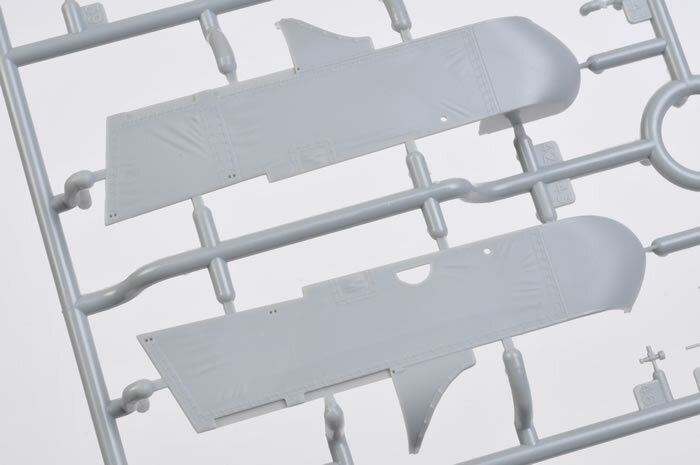 To test the strength of the wing to fuselage joint, I dryfitted the flying surfaces to a taped up fuselage that contained the interior structure. 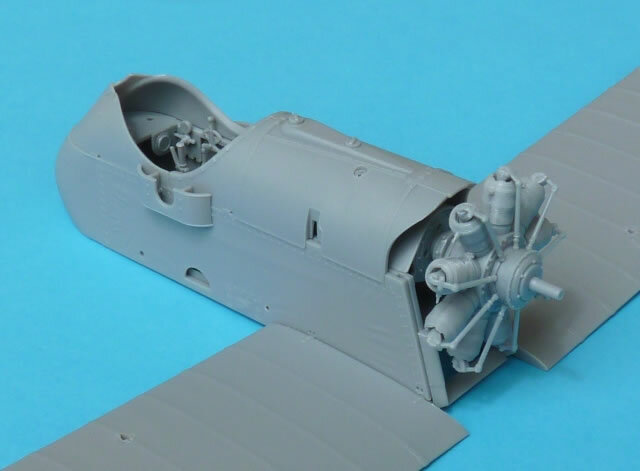 The completed assembly sat solidly on the workbench and could be moved around with impunity. So rigging doesn’t have to be structural and you can use any method you like. A single aircraft is represented on the instruction sheet and this is Fokker E.III 635/15 of Kampfeinsitzerkommando (KeK) Vaux, Somme 1916. As expected, the decals are well printed with everything in perfect register. Not only do we get the subjects individual markings, there’s stencil data, prop logos and instrument faces to utilise. They go on easily with or without setting solutions. The carrier film is thin and has been kept to a minimum. 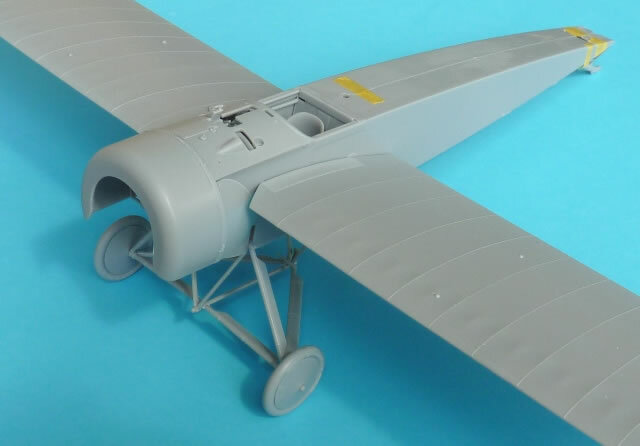 Despite sporting more parts, as well a complicated looking “lattice tail”, the DH2 builds just as easily as the Eindecker. 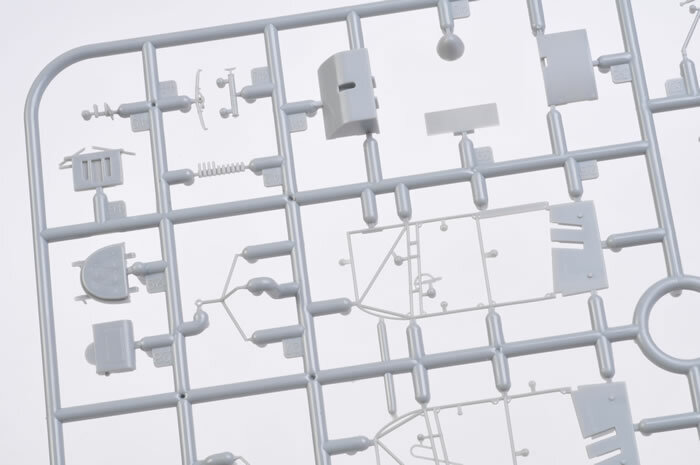 This is courtesy of the kit’s clever engineering which allows the positive location of both individual parts and sub-assemblies. 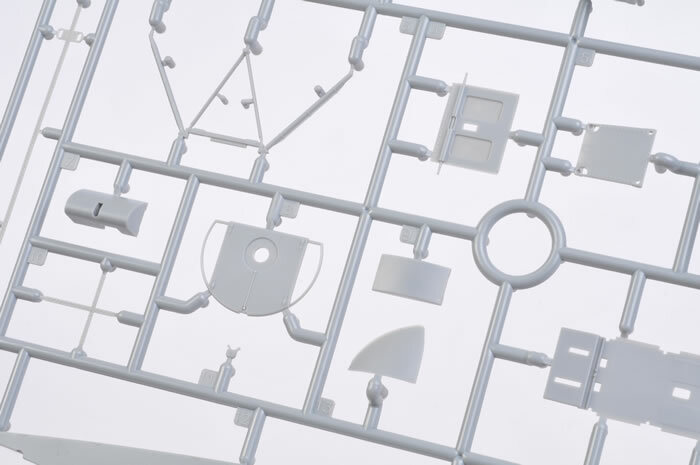 Inside the box’s second partition, we are greeted by 5 sprues of the familiar grey coloured plastic. 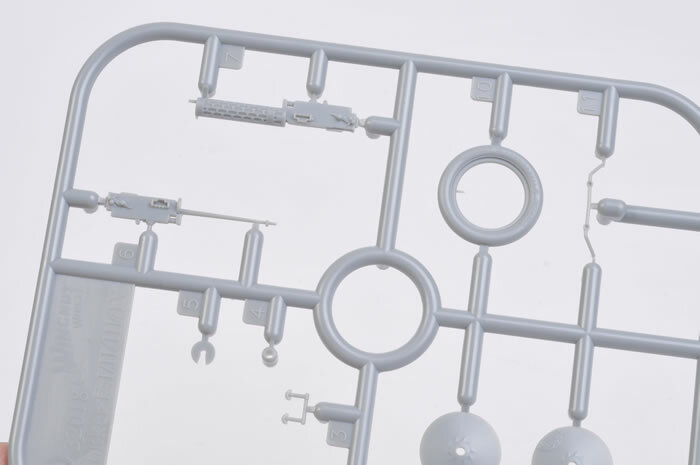 A clear sprue is also included that caters for a number of different windscreen arrangements. 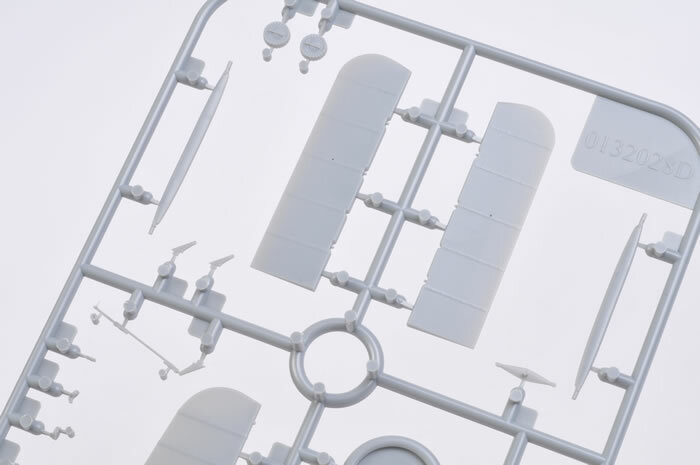 The nacelle interior is tackled first and can be treated as a model unto itself. Around 23 items make up this area, including photo etched parts for the lap belts. 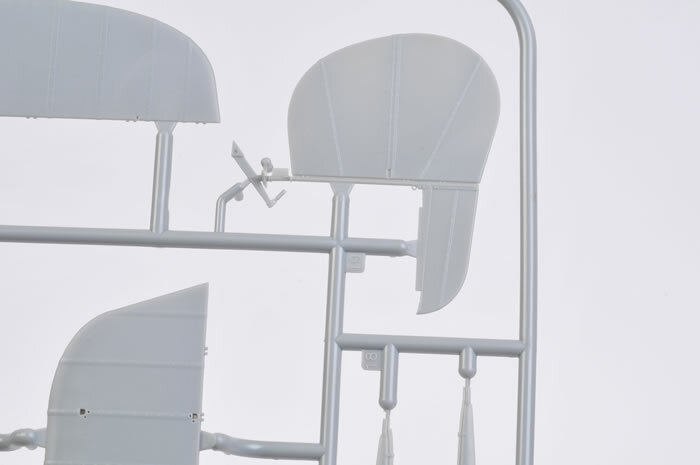 Control column, rudder bar, linkages, seat, altimeter, magneto switch, and fuel fine adjustment wheel, are many of the expected adornments, Others are the elevator trim lever and quadrant, rev counter, a couple of oil pulsators, air pressure valves and associated gauge. A number of different instrument arrangements are present in the kit, the one needed for this boxing is the typical “early” type. Other early and later 1916 layouts whet the appetite for future releases. Cleaning up the various cockpit parts call for a bit of care. The separate interior structure is quite delicate, especially with its incorporated pumping. A deft hand will do wonders here. The engine mounts need to be precisely located so that the shaft of the Gnome rotary is parallel to the line of flight. Careful dry fitting before the fateful application of glue ensures success. Instrument faces come in the form of some superbly printed decals. Bracing and control wires are colour coded in the instruction sheet. I was a little apprehensive about how the nacelle halves would fit around the comprehensive interior…but I needn’t have worried. 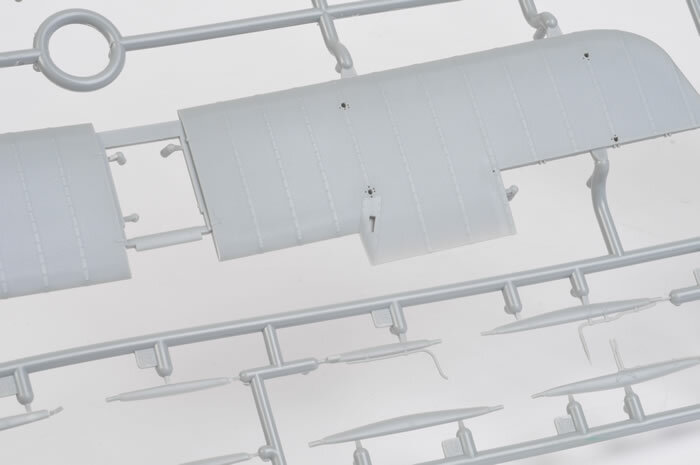 The frontal shelf conceals any internal join lines and the complete assembly is detailed with a subtle representation of wrinkled fabric. There is only one set of ejection pins that will not be concealed on the finished model. 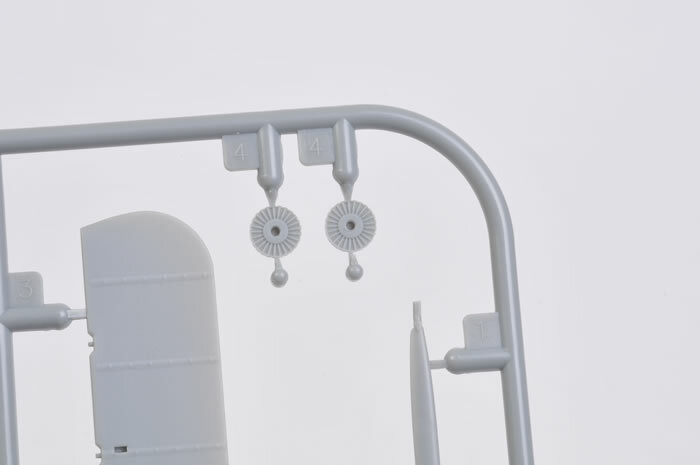 These are on each inner face of the nacelle. This necessary manufacturing evil is very shallow and can easily be filled and sanded with a few swipes of wet ‘n dry paper. As mentioned previously, the engine shares its cylinder halves with the Oberursel so the latter’s rearward facing spark plugs need to be cut away. Unlike the Oberursel, a wiring guide is not provided. 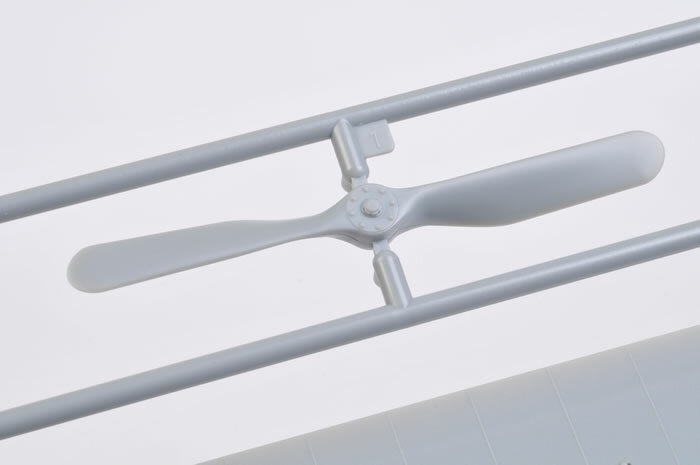 The one piece lower wing takes care of any dihedral setting problems. 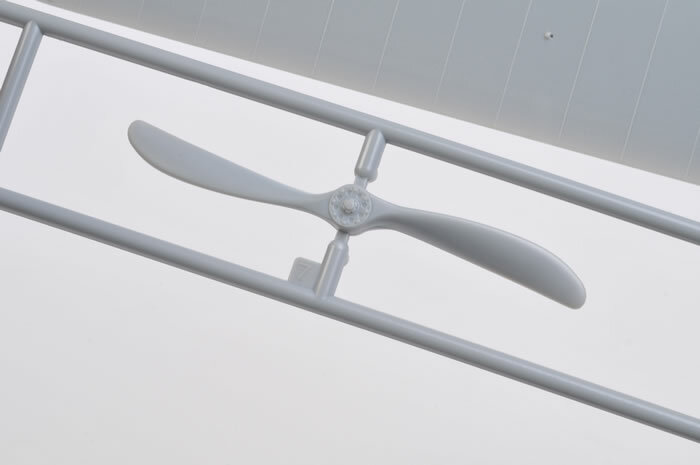 It fits snugly under the nacelle and provides a solid basis for the rest of the assembly. 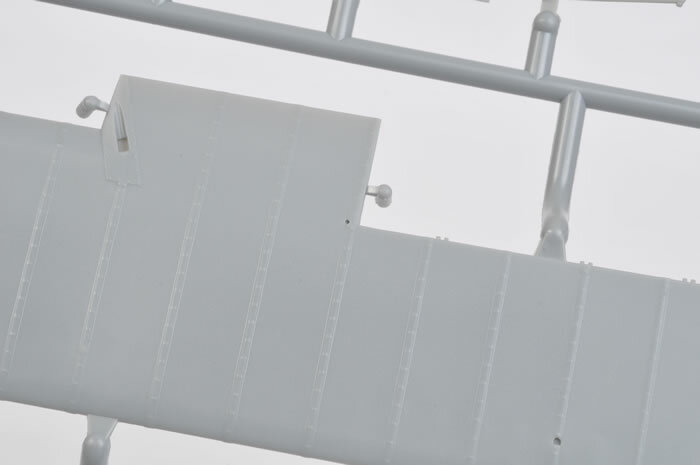 The upper wing on the original was constructed in 3 sections which are represented by a single part here. That’s good news because setting the angles of the outer segments could otherwise be problematic. As a result, these flying surfaces are quite complex, but their execution is exemplary. There’s not a blemish or ejection pin anywhere. 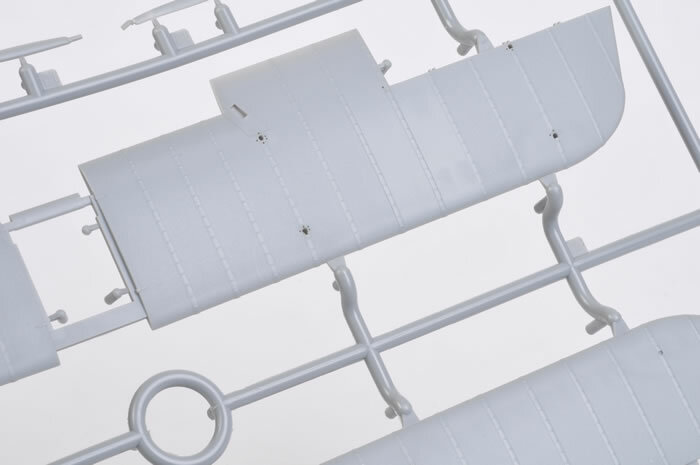 The ribs are fully rendered and each contains a beautifully subtle representation of the stitching. 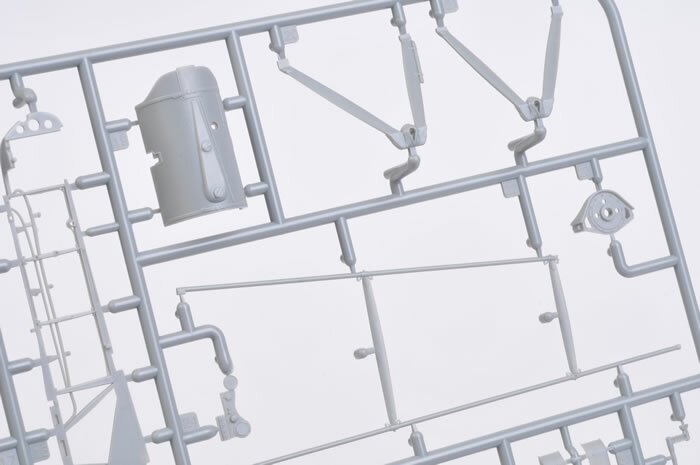 The many struts are not all the same, so don’t remove them randomly from the sprue. 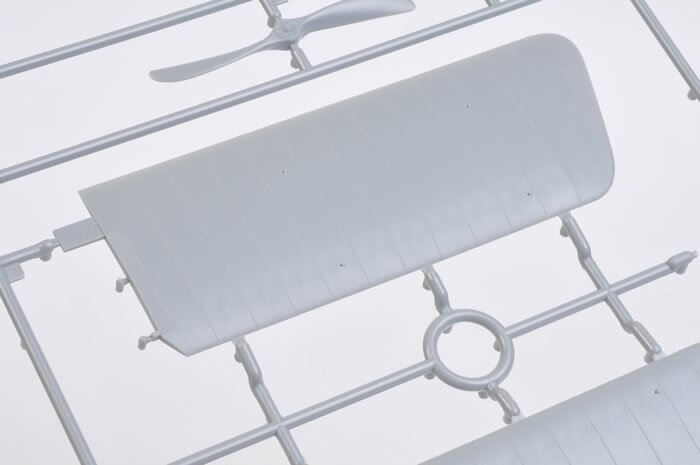 They are keyed for ease of orientation and the top wing fits effortlessly on top. 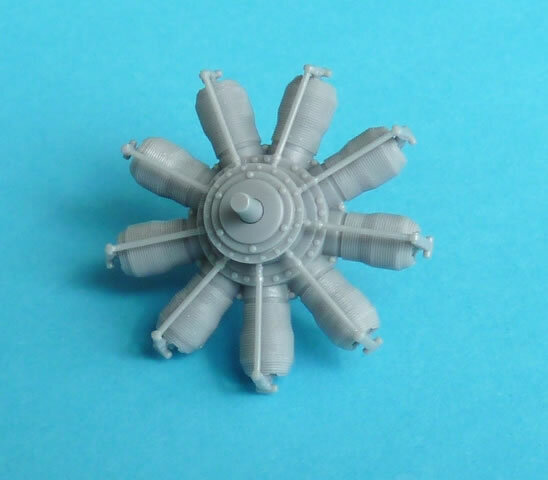 As with any “lattice tail”, the booms are the most fragile part of the model. Fortunately WNW has designed the location points for maximum rigidity. 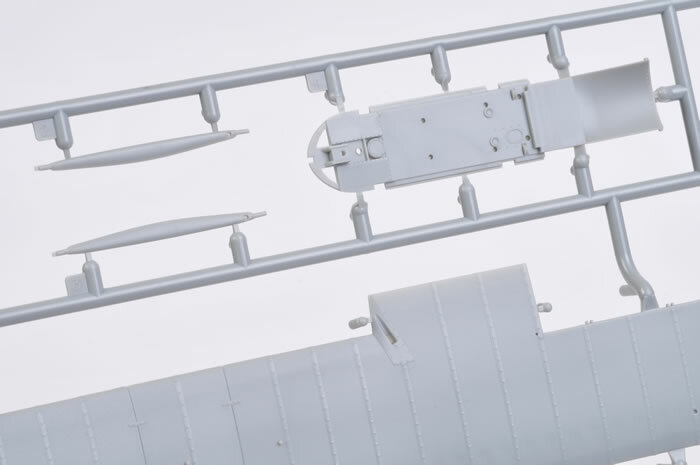 To try and ease the painting process, I decided to deviate from the instructions and assemble the booms and tailplane assembly as a separate unit. 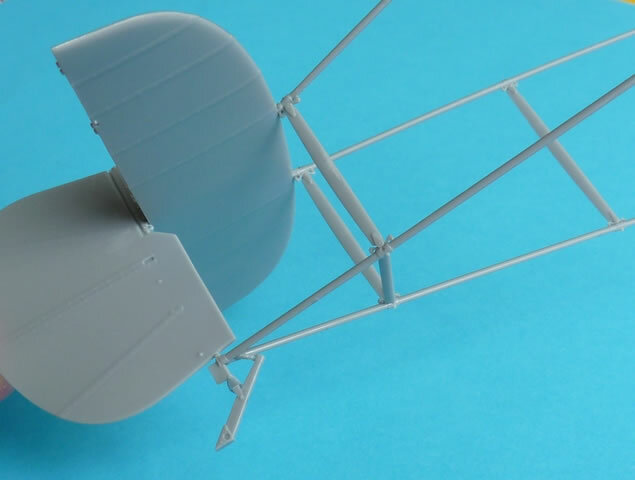 This can then be added towards the end of the build and carefully squared up with the rest of the aircraft. The rigging on a DH2 is extremely complex and it’s very easy to distort the booms. This is especially so if using monofilament for structural rigidity. 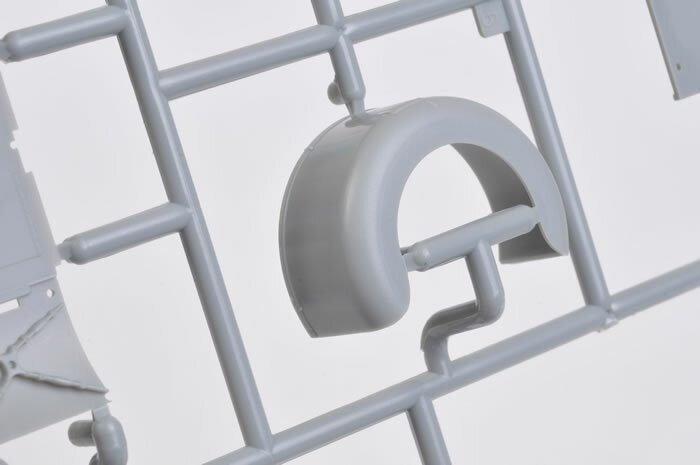 Safer methods involve stretched sprue, metal/carbon fibre rod, or even WNW’s EZ-line elastic thread. 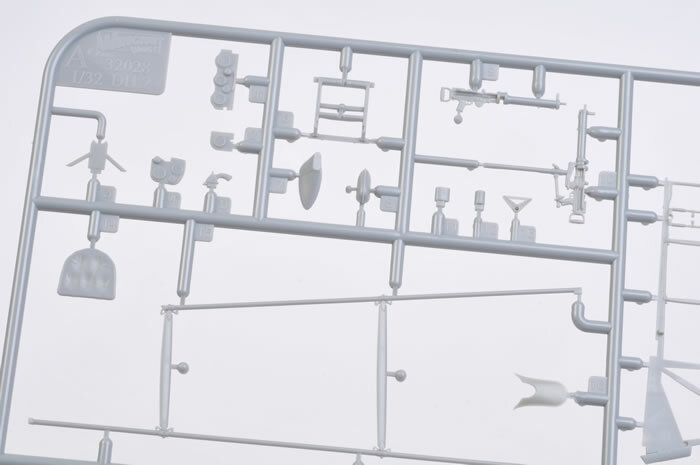 A diagram in the instruction booklet helps the modeller determine where these cables go but some additional reference material wouldn’t go amiss. The Eindecker’s adversary in this release is DH.2 serial 7851 of C Flight, 32 Sqn. It was flown by WGS Curphey to score the first of an eventual 6 victories on 22 August 1916. He met his death in a different DH.2 when shot down on 14 May 1917 by Franz Walz of Jasta “Boelcke”. The same German unit was responsible for the loss of “7851” when Erwin B?hme met WGS Wagner in combat on 7 Janurary 1917. Wagner lost his life after the combat with Bohme’s Albatros D.II at the age of 23. Once again, there are no registration problems on the decal sheet. This latest release from the Wingnut Wings sable follows the very high standards set previously. Both subjects share a common instruction booklet that doubles as handy piece of reference material. Period photos abound of the two aircraft types and the colour profiles are more of Ronny Bar’s exceptional work. 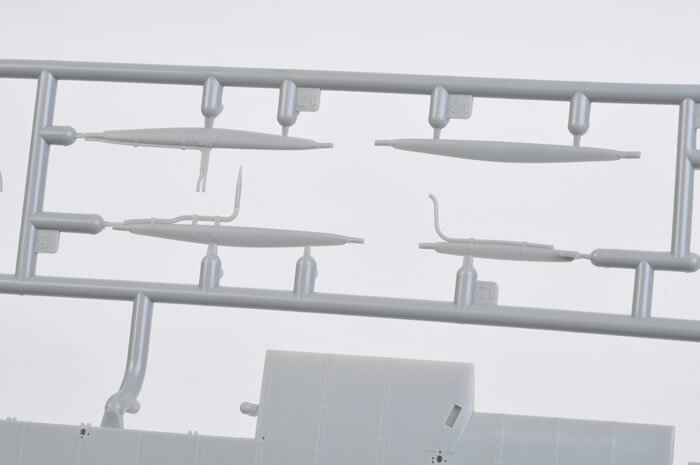 By coincidence, each aircraft has a rigging layout that would scare the average modeller. But it’s not as daunting as it first appears. Thanks to the clever engineering and informative instructions, the builder can tackle the task with confidence. Accuracy is not a problem when compared with recognised plans. This includes those in the recent Eindecker Compendium by Josef Scott. 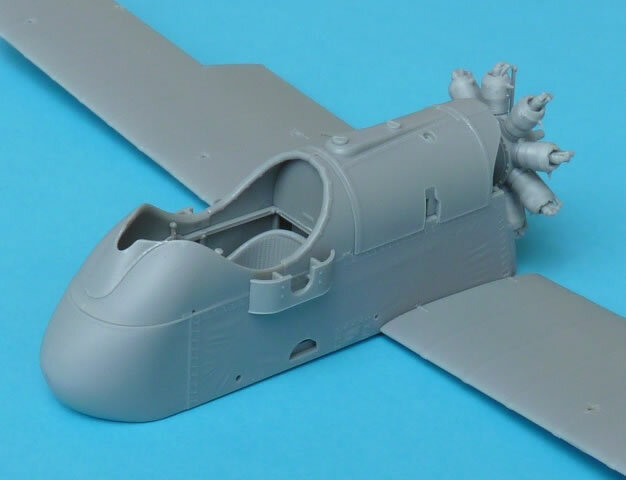 Without doubt these kits are the best of their breed in any scale and are a worthy addition to the ever increasing range of subjects from Wingnut Wings.